As the thread of military intervention by US air-strike now is fading and US-Russian agreement (The Four-stage Plan For Syria ) is going to implementation stage the situation on the ground however has good possibility to escalate. Instead of air-strike US is now more openly supplying weapons to Syrian opposition hoping so to reach her foggy aims. Latest developments show failure also with this strategy. Demolition of CW stockpiles of Al-Assad regime or even neutralization of CW in a rebel’s possessionis only contributory factor in the Syria war. According to the British newspaper The Telegraph the study showed that the number of insurgents fighting against the Syrian army is estimated at about 100 thousand gunmen distributed to about a thousand armed band, who came from 83 countries, including all Arab countries except Djibouti. 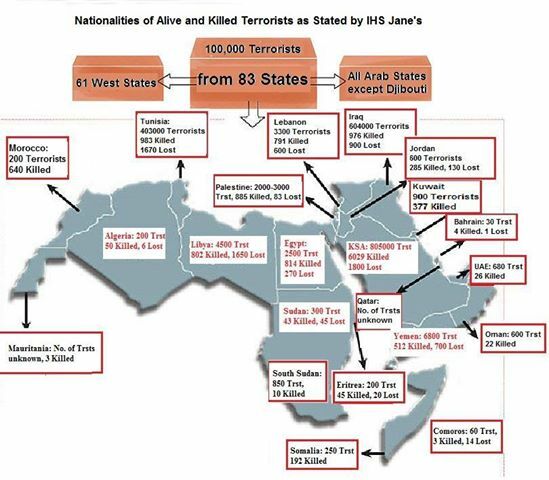 Estimates by IHP Jane’s’ experts revealed that ten thousand of these gunmen fight to the side of Al-Qaeda affiliated groups, and 30,000 to 35,000 other insurgents are fighting within other hard-line armed groups. Few days ago a statement was released in the name of a number of Syrian rebel factions announcing the severing of all ties with Brigadier General Salim Idris’s Free Syrian Army (FSA), the Supreme Military Council (SMC), the Syrian National Council (SNC), and its parent organization, the Supreme National Coalition (the other SNC). The document is entitled “On the Coalition and the Provisional Government” and lists out four major points. The first point calls for all military and civilian forces to unite under an Islamic framework is based on the sharia (Islamic Law), making it the sole source of legislation. The second point is that only those members of the Syrian opposition who have “lived their concerns and shared in their sacrifices” are entitled to represent the people of Syria. Thirdly, the signatories consider all coalitions formed outside of Syria as illegitimate and refuse to recognize the provisional government led by Ahmad Tumeh. Included among the eleven groups that have signed on to this Islamic Alliance are those moderate Islamists of the Muslim Brotherhood persuasion with the closest ties to the SNC, such as Liwa al-Tawhid or the Brigade of Unity, the Suqour al-Sham Brigades, and Liwa al-Islam; three groups that had formed a coalition back in September of last year called the Syrian Islamic Liberation Front (SILF). Also joining the alliance are such hardline Salafi Islamists as Ahrar al-Sham and the Fajr Islamic Movement, who had formed a coalition of their own called the Syrian Islamic Front. 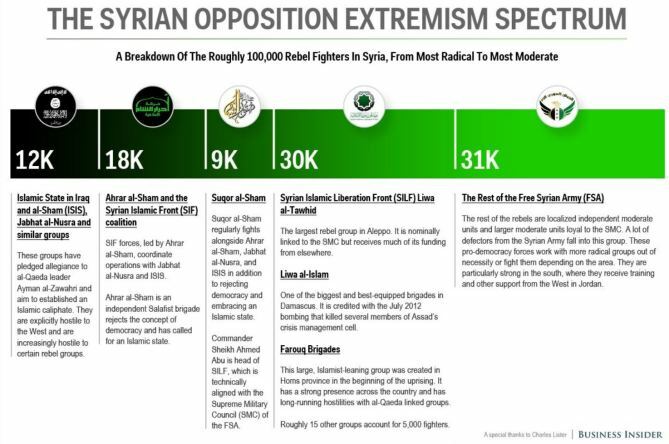 The leading force in the alliance are the Salafi-Jihadist, Al-Qaeda branchAl-Nusra Frontwhich is considered the most extreme and the most militarily capable of opposition groups, comprised mainly of Syrians who fought in the Iraqi insurgency. (Source: SyriaReport) Conclusion: the Western-backed moderate/secular camp and the Islamist camp have now firmly ensconced themselves in the latter. The Al-Nusra Front (Jabhat al-Nusra) seeks to overthrow the Assad regime and set up an Islamic Caliphate ruled by religious Islamic law (the Shari’ah) in Greater Syriaincluding Syria, Lebanon, Jordan, Israel and the Palestinian Authority. During the Syrian civil war two branches of Al-Qaeda established themselves among the rebel organizations fighting to overthrow the regime of Bashar Assad. The most prominent is the Al-Nusra Front (Jabhat al-Nusra), directly subordinate to Al-Qaeda leader Ayman al-Zawahiri. The other is The Islamic State in Iraq and Greater Syria, subordinate to Al-Qaeda in Iraq. In addition, other Salafist-jihadi military organizations not necessarily affiliated with Al-Qaeda operate in Syria. The two Al-Qaeda branches have an estimated 6,000-7,000 operatives, and in our assessment the number is growing. Related to chemical weapons of the opposition side an indictment from the Adana Public Prosecutor’s Office has declared that anti-Assad gangs are known to be producing chemical weapons inside of Turkey.Prosecution attorney presented the court with a 132-page document which contained prosecution attorney’s gathered evidence of the suspects’ links to terrorist groups in Syria including al-Nusra Front and al-Qaeda-linked Islamic States on Iraq and Levant (Ahrar al-Sham).On May 28 Turkish security forces found a 2-kg cylinder with sarin gas after searching the homes of terrorists from the al-Qaeda-linked al-Nusra Front who were previously detained. A thorough analysis about Al-Nusra Front can be found from here (Analysis: The Al-Nusra Front, 167 p also in my document library). Russia has proposed a four-stage plan to avert a US attack on Syria. 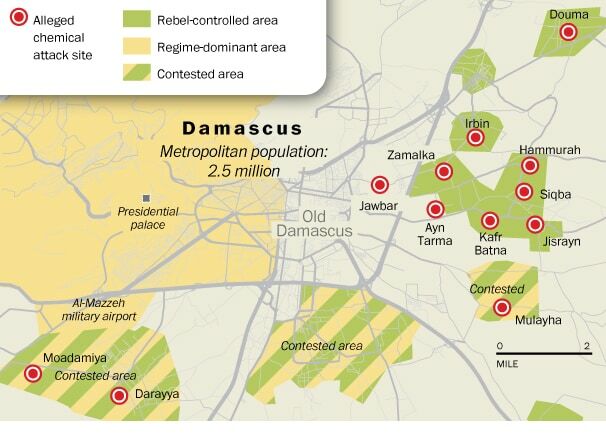 The key component of plan is placing Damascus’ chemical weapons under international control. 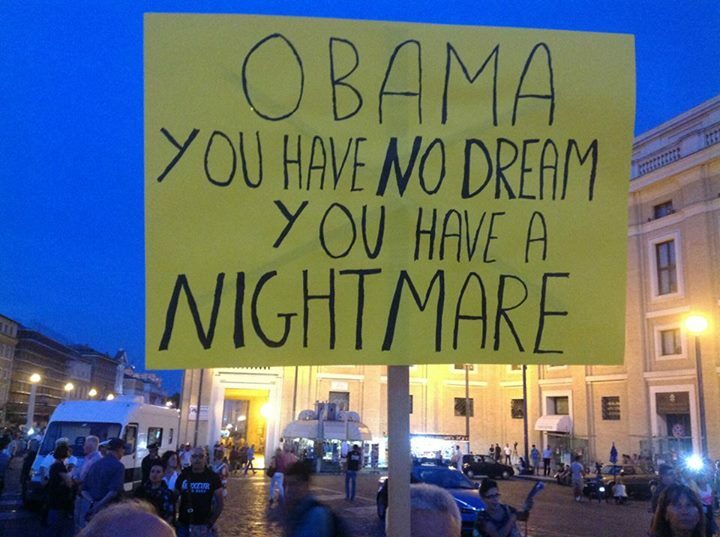 The original initiative was presented to President Obama in Stockholm by Nordic leaders before G-20 in St Petersburg. Russia’s proposal was announced on August 9th, 2013, hours after US Secretary of State John Kerry said Syria could avoid a US strike by surrendering all his chemical weapons within a week, but immediately made clear he was not making a serious offer. However Russia took the case seriously and made a workable, clear and concrete plan. 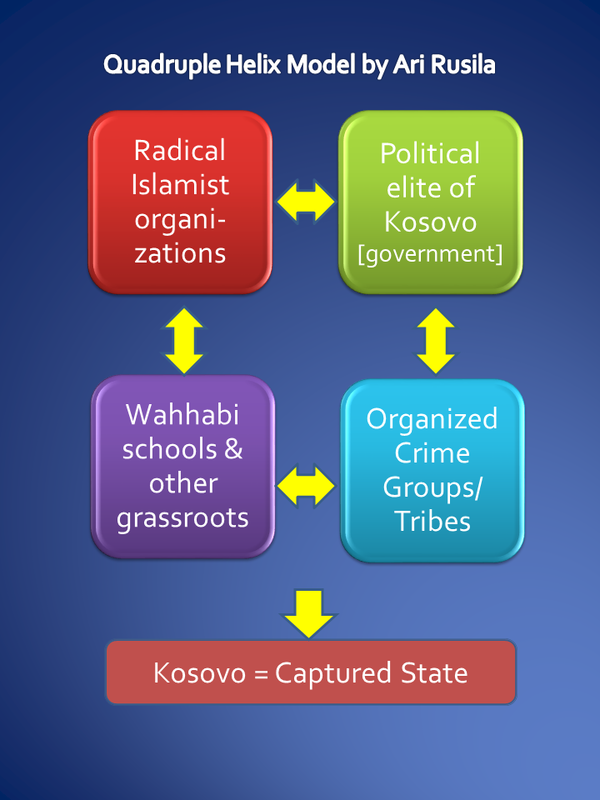 The hastily organized talks started in Geneva on August 12th, 2013. The top Russian diplomat Lavrov and US counterpart John Kerry have both team of experts on chemical weapons with them to the talks. After two days in Geneva the discussions are described to been constructive. The first stage of the Russian plan provides that the Syrian government in Damascus becomes a member of the Organisation for the Prohibition of Chemical Weapons (OPCW). The Organisation for the Prohibition of Chemical Weapons (OPCW) is located in The Hague, Netherlands, and is an alleged intergovernmental organization. The second step of this four-stage plan by Russia about the chemical stockpiles in Syria provides that the Syrian governance of President Bashar al-Assad has to declare the location of the chemical arsenals (chemical weapons stockpiles) and to say where the chemicals are produced on Syrian soil. The third step of the Russian plan on Syria’s chemical weapons provides that the inspectors of the alleged intergovernmental Organisation for the Prohibition of Chemical Weapons (OPCW) are allowed to enter Syria and are able, without preconditions, to investigate and check the locations of the chemical weapons arsenals and the production centres for the chemicals. The final step of the Russian four-stage plan provides that all sides have then to decide, in a cooperation with the inspectors of the Organisation for the Prohibition of Chemical Weapons (OPCW), how to destroy the chemical weapons substances and arsenals from Syria. The time-axis is demanding. While the first step – Damascus becomes a member of the Organisation for the Prohibition of Chemical Weapons (OPCW) – took only days implementation of the final step -destroying the chemical weapons – can take decades. Today only US and Russia have developed technology forthis task and it might be wise to have a joint operation for this destroying, it is also possible to build facilities in Syria for disposal of Cws. The extra challenge in Syria is that the country is a war zone. While it is estimated that al-Assad’s regime has CW stockpiles in some 50 locations the logistics and security are extreamely challenging in this kind of circumstances. It is estimated that to secure CW locations it is needed minimum 70,000 well trained soldiers. If the deal between international community and al-Assad regime about CW question will be made it is possible that the war between al-Assad regime and rebel groups as well between rebel groups however will intensify in short-term with conventional weapons.That’s way in my opinion a fifth aspect should be included in action plan namely get all or most part of local stakeholders, without preconditions, in negotiation table for planning the future Syrian state. The Obama administration’s public case for attacking Syria is full of inconsistencies and hinges mainly on circumstantial evidence, While a punitive strike against Bashar Assad’s regime is ready to start immediatelly the public reasons for attack are losing ground every day while the risks about escalation of conflict are rising simultaneously. In my opinion the U.S address of missile-strike might not be the right one so before any actions it would be wise to spend some time to clarify – whodunnit. There’s little dispute that a chemical agent was used in an Aug. 21 attack outside of Damascus – and probably on a smaller scale before that – but there is a reasonable doubt if the Assad regime used sarin gas in this operation. For me it is difficult to see what desperate situation would have caused al Assad to use chemical weapons (CWs) and take the risk about intervention as he already is winning the war . His opponents however have the motivation. Below I have tried to collect information from different sources about alternative explanations for Damascus gas-attack in Aug.21. I try to show that besides motivation the rebels had also the opportunity and CWs to implement this ”casus belli”. Some say they have some of the known Libyan stockpile. Some say Turkish agents made it for them. Some say Qatari agents delivered small amounts of chemical weapons to certain factions of Syrian rebels. The Washington Post noted that a terrorist organization were among rebels who seized the Sheik Suleiman military base near Aleppo, where research on chemical weapons had been conducted. Also the al-Nusra Front — an anti-Assad group that has been labeled a terrorist organization by the United States and is also known as Jabhat al-Nusra — had seized a chlorine factory near the town of Safirah, east of Aleppo. Safirah has served as a major production center for such munitions. Late Saturday night, it was reported that FSA fighters captured a Syrian chemical factory used to make toxic chlorine. Some reports suggested that the chloride factory at Al-Safira, southeast of Aleppo, is a also a chemical weapons depot and research station with chemical tipped scud missiles. The town, along with the factory has reportedly been overrun by jihadists who are purportedly fighting the Syrian government. 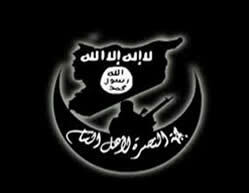 The jihadists are members of al Nusra, a terrorist group associated with al-Qaeda. Sure the U.S officials would hope to rule out that CW stocks had fallen out of the government’s control and were deployed by rebels in a callous and calculated attempt to draw the West into the war; this is however a real possiblity. The armed Syrian opposition has got their hands on chemical weapons, which they acquired from Libya, already in Summer 2012, a media report claims. They allegedly plan to use it against civilians and pin the atrocity on the Bashar al-Assad regime.­The report by DamPress claims the opposition group in possession of the weapons is being trained in its use inside Turkey. Even mainstream sources confirm that Al Qaeda terrorists from Libya have since flooded into Syria to fight the Assad regime … bringing their arms with them. And the post-Gaddafi Libyan government is also itself a top funder and arms supplier of the Syrian opposition. More about issue from The McClatchy report. According to a report in Turkey’s state media agency Zaman, agents from the Turkish General Directorate of Security (Emniyet Genel Müdürlüğü) ceased 2 kg of sarin gas in the city of Adana in the early hours of yesterday morning. The chemical weapons were in the possession of Al Nusra terrorists believed to have been heading for Syria. The EGM identified 12 members of the AL Nusra terrorist cell and also ceased fire arms and digital equipment. This is the second major official confirmation of the use of chemical weapons by Al-Qaeda terrorists in Syria after UN inspector Carla Del Ponte’s recent statement confirming the use of chemical weapons by the Western-backed terrorists in Syria. A prominent member of the Free Syrian Army claims the rebels have all the components to produce chemical weapons and have the know-how to put them together and use if necessary.“If we ever use them, we will only hit the regime’s bases and centers,” the political adviser of the Free Syrian Army (FSA), Bassam Al-Dada, was quoted by Turkey’s state-run Anatolia news agency. A former member of a city council in the Turkish province of Hatay says that the chemical weapons used in last month’s attack in Syria were transported from Turkey,Press TV reports. “Four months ago, Turkish security forces found a two-kilogram cylinder with sarin gas after searching the homes of Syrian militants from the al-Qaeda and al-Nusra. They are using our borders to take the gas into Syria,” Mohamad Gunes said. The residents believe the Turkish government is allowing the transfer of weapons because Ankara is trying to create a pretext in order to wage war on its neighbor. This video from a Syrian TV news report claims to show chemicals (some of labels on these chemicals are in English) and weapons seized by the Syrian government in the rebel stronghold of Jobar. The mysterious explosion in March 2013 near the city of Aleppo, which killed 26 people and wounded dozens, was swiftly labeled by Western intelligence agencies as a chemical incident perpetrated by forces loyal to Assad. The explosion claimed the lives of Syrian Armed Forces soldiers who are apparently loyal to Assad, and the Syrian government was quick to demand an international investigation of the incident. These two facts would indicate that Assad’s forces were not behind the attack. It appears that the target of the attack was a checkpoint manned by Syrian Armed Forces, which reinforces the theory that rebel forces, probably jihadists known to be operating around Aleppo, were behind it. FM Kerry claims that there is scientific evidence to support the U.S. narrative that the Assad regime used sarin gas in an operation that killed 1,429 people, including more than 400 children. However neither Kerry’s remarks nor the unclassified version of the U.S. intelligence explained how the U.S. reached this mentioned death toll. Old practice – at least since Bosnian war – of numergame seems to used again asthe British assessment was “at least 350 fatalities” while the Syrian Observatory for Human Rights confirmed 502 dead, including about 100 children and “tens” of rebel fighters, and an unclassified version of a French intelligence report confirmed only 281 fatalities. Besides numbers there is a doubt if all deaths are due sarin gas. The Damascus Center for Human Rights Studies, an anti-Assad group, said that it had been able to document 678 dead from the attacks, including 106 children and 157 women. “Western experts on chemical warfare who have examined at least part of the footage are skeptical that weapons-grade chemical substances were used, although they all emphasize that serious conclusions cannot be reached without thorough on-site examination. “Dan Kaszeta, a former officer of the U.S. Army’s Chemical Corps and a leading private consultant, pointed out a number of details absent from the footage so far: ‘None of the people treating the casualties or photographing them are wearing any sort of chemical-warfare protective gear,’ he says, ‘and despite that, none of them seem to be harmed.’”If the “massacre” at Ghouta involved military-grade nerve gas, all those doctors and others milling around the fallen victims would be dead or in serious trouble. That’s because the poison would stick around for days, penetrating the skin and being inhaled by anyone who came close to them or even entered the vicinity. A key point in the government’s white paper is “the detection of rocket launches from regime-controlled territory early in the morning, approximately 90 minutes before the first report of a chemical attack appeared in social media.” It’s unclear why this is supposed to be persuasive. Do rockets take 90 minutes to reach their targets? Does nerve gas escape from rockets 90 minutes after impact, or, once released, take 90 minutes to cause symptoms? 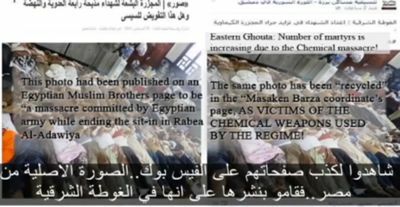 One other evidence is a video published by ”Brown Moses Blog” which seems to show Syrian army preparing CW attack whereas it is debunked with anonther video – Syria CW “Evidence” by “Brown Moses Blog” Debunked . With the assistance of former PLO member and native Arabic-speaker Walid Shoebat, an independent news company WorldNetDaily (WND) has assembled evidence from various Middle Eastern sources that cast doubt on Obama administration claims the Assad government is responsible for attack in Damascus. Their findings can be found in WND/Politics article Evidence: Syria gas attack work of U.S. Allies by Jerome R. Corsi, a Harvard Ph.D.
On the other side intelligence which overheard Syrian military officials discussing the attack—far from implicating them—finds them denying they initiated an attack. August 11, 2013 a reportin The Telegraph discussed the rebels attacking the Latakia village and Sheikh Mohammed Reda Hatem, an Alawite religious leader in Latakia said ”Until now 150 Alawites from the villages have been kidnapped. There are women and children among them. We have lost all contact with them.” Some of those children were found less than two weeks later, in Ghouta. They are in fact children who were abducted by jihadists two weeks before in Alawite villages in the surroundings of Latakia, 200km away from Ghouta. Contrary to the sayings of the Free Syrian Army and the Western services, the only identified victims of the Ghouta massacre are those belonging to families that support the Syrian government. In the videos, the individuals that show outrage against the ’’crimes of Bashar el-Assad’’ are in reality their killers. Some photographs had already been distributed by the Atlanticist media to accuse the Egyptian Army of a massacre at a camp of the Muslim Brotherhood in Cairo. The same phote has been ”recycled” to describe CW attack in Ghouta, Syria. Using fake pictures to support a fake claim makes sense to me. Secretary of State John Kerry opened his speech Friday by describing the horrors victims of the chemical weapon attack suffered, including twitching, spasms and difficulty breathing.Attempting to drive the point home, Kerry referenced a photograph used by the BBC illustrating a child jumping over hundreds of dead bodies covered in white shrouds. The photo was meant to depict victims who allegedly succumbed to the effects of chemical weapons via Assad’s regime.Also the BBC is facing criticism after it accidentally used a picture taken in Iraq in 2003 to illustrate the senseless massacre of children in Syria. The picture, which was actually taken on March 27, 2003, shows a young Iraqi child jumping over dozens of white body bags containing skeletons found in a desert south of Baghdad. In the message August 22 Eugene Furst congratulates Col. on successful operation and refers him to Wasington Post publication about chemical attack in Syria. From the Anthony’s wife dialog with her friend it’s clear the video with the children killed in the chemical attack near Damascus was staged by U.S. Intelligence.This is a huge coup for the people. This proves that the chemical attack was indeed a false flag operation. M.SHAPIRO: I can’t stop thinking about that terrible gas attack in Syria now. Did you see those kids? I was really crying- They were poisoned, they died. When is it over? I see their faces when in sleep. What did Tony say you about this? Indeed the “pressure” to strike Syria comes from corporations which profit from war, including private central banks, and corporations which make the instruments of war – not from the so-called “red line” that was supposedly crossed with use of chemical weapons by the Assad regime. The official ”public” truth in U.S claims that Assad’s regime is perpetrator of Damascus gas-attack as the rebels don’t have chemical weapons. However, multiple lines of evidence show that the rebels do have chemical weapons. One should remember that the opponents of Assad regime have possiblity and motivation to use chemical weapons and indeed they probably have already used them in Spring 2013. It might be also possible that lower-ranking officers in al Assad’s military used chemical weapons without his knowledge and perhaps against his wishes. Anyway even in this case there is no reason to military attack against al Assad. Civil wars have a way of turning ugly; unfortunately, outside intervention is likely to make a bad situation even worse. The threat of imminent U.S. military action appeared to fade on September 9th 2013 when Syria agreed to a Russian proposal to surrender its chemical weapons to international control. As I have described before this does not utterly solve CW problem as there will be still a question about CWs in a possession of rebels have but I think this can be managed. Now in my opinion it is crucial to put pressure to all sides to start talks and peace process without preconditions and fast. Appendix 2: Syrian Girl: 8 Reasons Why The NWO Hates Syria! 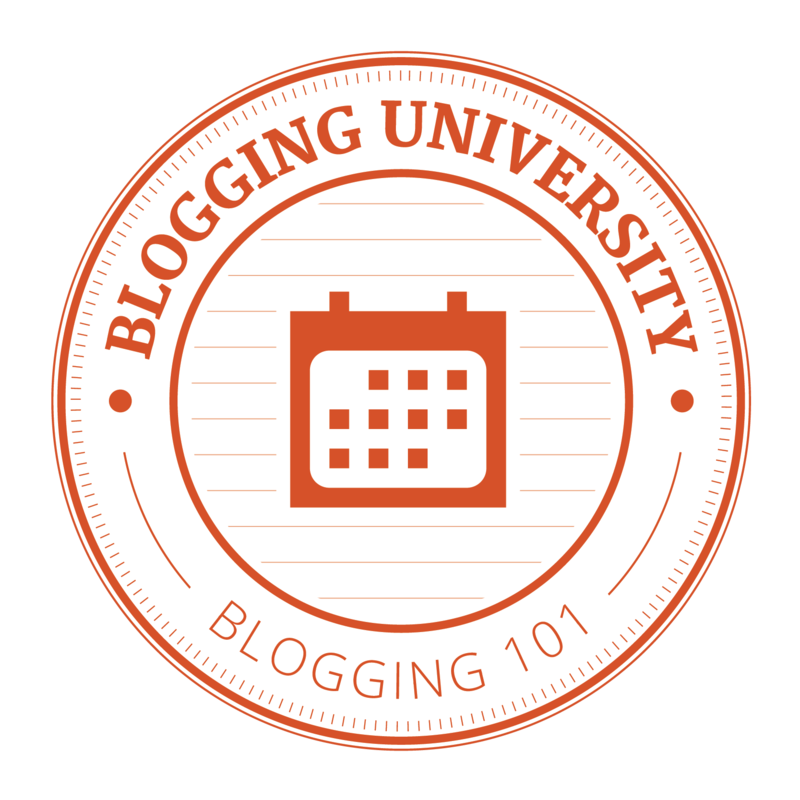 You are currently browsing the Conflicts by Ari Rusila blog archives for September, 2013.